Every story of nature revolves around life forces. Do we know what connects us all? Can we see the links? Bernd Heinrich, Professor Emeritus in the biology department of the University of Vermont, has written twenty six books about nature, ecology, evolution, biology as well as birds. Some of his books are about his cogitations about nature and the interactions he has observed over the years. One Wild Bird at a Time presents snapshots of several different species of birds as they arrive, stay, go, raise families, eat, communicate and spend time around Heinrich’s cabin in the forests of western Maine. He has had no trouble keeping up with the birds. The man participated in ultramarathons and set two American track records in 2007 for one hundred miles and one hundred kilometers. He was sixty seven years old at the time. 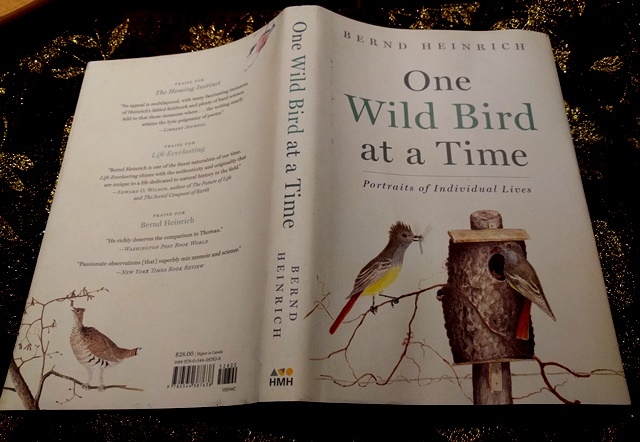 One Wild Bird at a Time is based on meticulously recorded observations written by Bernd Heinrich as he followed each of his select feathered friends over months or years. His short stories are accompanied by his own illustrations that enliven his experiences. To view flickers, he actually removed part of the wall inside his cabin, leaving a loose panel that allowed him to look at the nest. For the crows he hunted the snowy roads and fields for dead animals. He put the carcasses in areas where crow behavior could be monitored. Yellow-bellied sapsuckers drummed their mating intentions with vigor, loudness and intensity. To the Barred owl he fed meat through the cold winter, and his friend returned the next year. Bernd monitored troops of blue jays, tracked grouse’s sleeping quarters in the deep snow, rejoiced when the red-winged blackbirds migrated into his area each year, and reminisced about the woodcock from his youth. This gamebird has experienced a downward plunge in population for thirty years due to habitat alteration. Every spring, since he was a boy at his family’s farm, the man waits for the woodcock’s skydance and display. Bernd exercises great perseverance when following his birds. He is thoroughly at home in nature. Through frigid temperatures, deep snow, brilliant spring days, life and death, and time, he focused on one aspect of each bird species. He began with a question, looked for a pattern and developed a tentative hypothesis, dodging the twists and turns the birds presented. At times his explanations panned out, but at others he was left clueless. Birds can be mysterious.